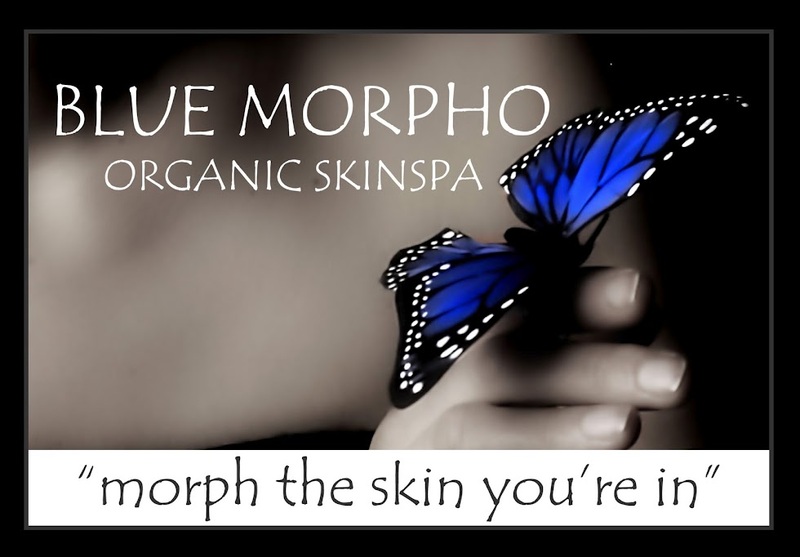 My friend Kate, owner of Blue Morpho Skin Spa (who gives FANTASTIC organic facials!!!) 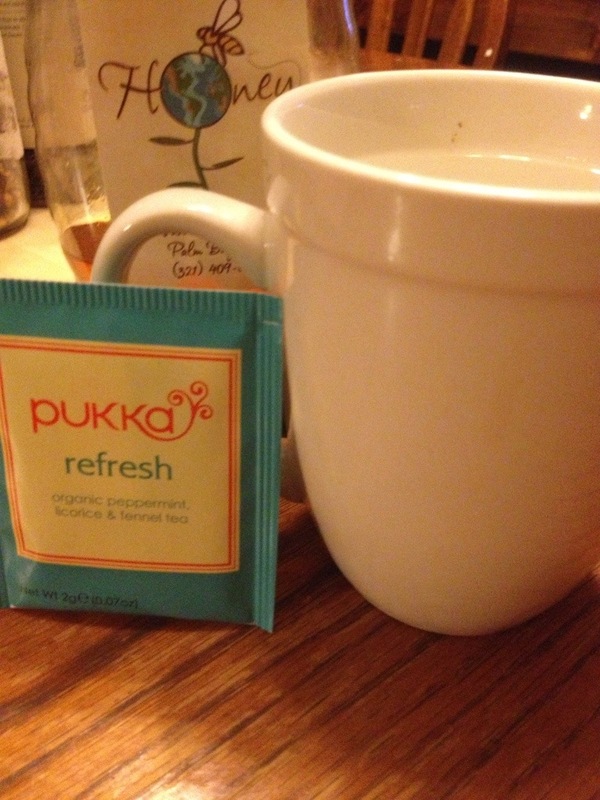 recently introduced me to Pukka’s Refresh Tea. It’s a blend of peppermint, fennel, and rose and, while I thought this combination was a bit odd, it turned out to be slightly sweet and the perfect way to complete my evening. Replace your current nighttime treat with this tea, and I promise your sweet tooth will thank you! Chicken Meat, Water, Contains Less than 2% of the Following: Evaporated Cane Juice, Garlic Powder, Onion Powder, Rice Starch, Sea Salt, Spice. 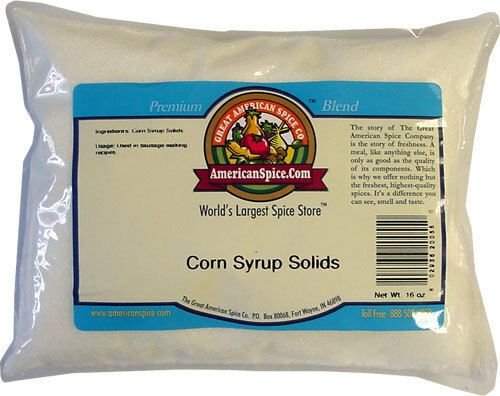 Battered & Breaded with: Whole Wheat Flour, Water, Wheat Flour, Corn Starch, Evaporated Cane Juice, Sea Salt, Leavening (Baking Soda, Cream of Tartar), Garlic Powder, Yellow Corn Flour, Yeast, Onion Powder, Spice, Sunflower Oil, Extractive of Turmeric. 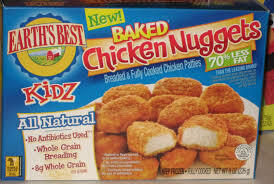 Breading Set in Expeller Pressed Canola Oil and/or Soybean Oil and/or Safflower Oil. Along side these nuggets, I served large romaine leaves and our container of pre-cut veggies. 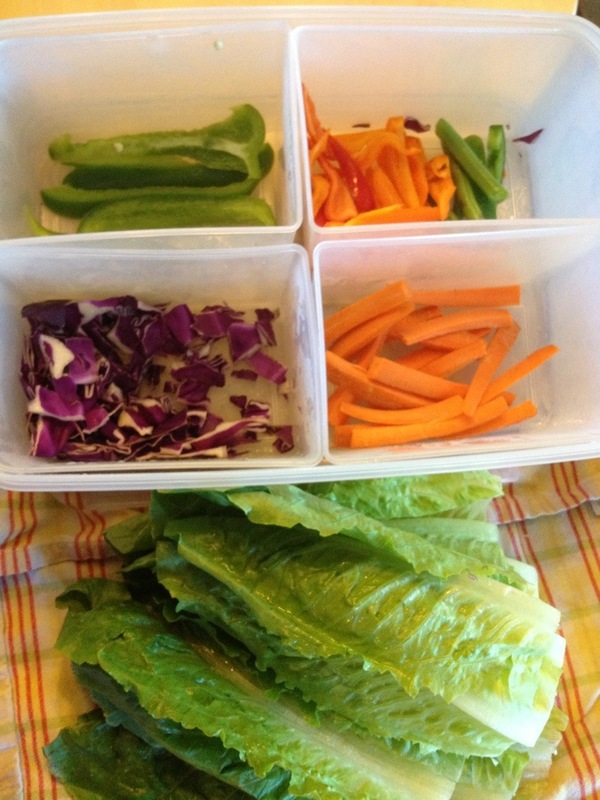 My kids have recently begun to create their own lettuce wraps with fresh veggies and dressing, and it seems to be a fun “trick” to get them to eat more vegetables. A fast and easy weeknight dinner (served on paper plates 😉 ) – a need we all have on those crazy nights! 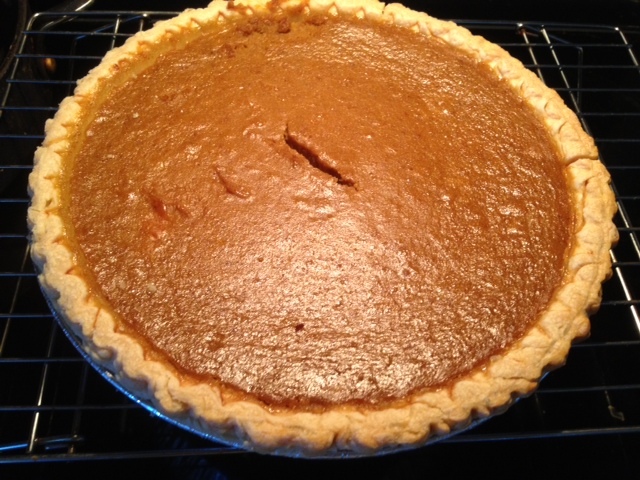 This pumpkin pie was one that I made for Thanksgiving. I used Wholly Wholesome’s organic frozen pie crust (which I found at Publix and it was deliciously wonderful!) and adjusted the recipe on the can of pureed pumpkin to fit my “eating clean” lifestyle. Mix sugar, syrup, cinnamon, salt, ginger and cloves in small bowl. Beat eggs or egg whites in large bowl. Stir in pumpkin and then add sugar mixture. Slowly add in almond milk. Pour into frozen pie shell. Preheat oven to 425° F. Bake for 15 min. Reduce temperature to 350° F and bake for 40 to 50 minutes or until knife inserted near center comes out clean. Loosely tent with foil if crust begins to brown past your liking. Cool on wire rack for 2 hours. 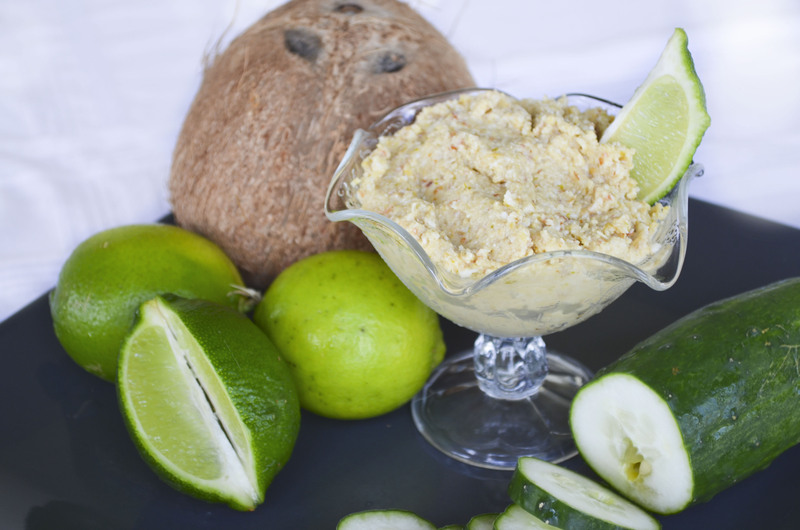 Coconut Lime Hummus with Cucumber Slices ~ Or try it with graham crackers for a Key Lime pie-like treat! As a wife and mom, I strive to feed my family healthy and nutritious foods so we can work and play to the best of our abilities. As I was feeding apple slices and peanut butter to my kids one summer afternoon, the wheels in my head started turning, and I decided to try making a sweet hummus and came up with a yummy creation- Cinnamon Raisin Hummus! From that, several other flavors evolved and I began to sell them to family, friends, and friends of friends. Now my product is available at Downtown Produce in Melbourne as well as The Melbourne Beach Market. About twice a month, you can find me at the Brevard County Farmer’s Market at Wickham Park on Thursdays from 3:00-7:00 PM. All my hummus flavors are gluten-free, dairy-free, soy-free, and vegan-friendly! These flavors are packed full of complex carbs, are high in protein, and have a good dose of healthy fats. This is a great way to satisfy your sweet tooth and keep you feeling full! If you have any questions, please e-mail me or call! My oldest, Aleyah, recently asked me what I do with the money that I make from my hummus. I was happy to report that the money I earn from my sales goes towards paying for her and her sister’s ballet tuition. According to the 3/50 Project, for every $100 spent in locally-owned business, $68 returns to the community! I love selling my sweet hummus because it promotes whole and clean eating, it provides me with the means to allow my girls to dance, and I know that I am giving back to my community! Use a cake mix and a vanilla pudding mix and make my own chocolate ganache. I used Dr. Oetker’s Organic Vanilla Cake Mix and Dr. Oetker’s Organic Vanilla Pudding Mix. I’ve used the cake mixes many times before, but this was my first time cooking with and tasting the pudding mix. 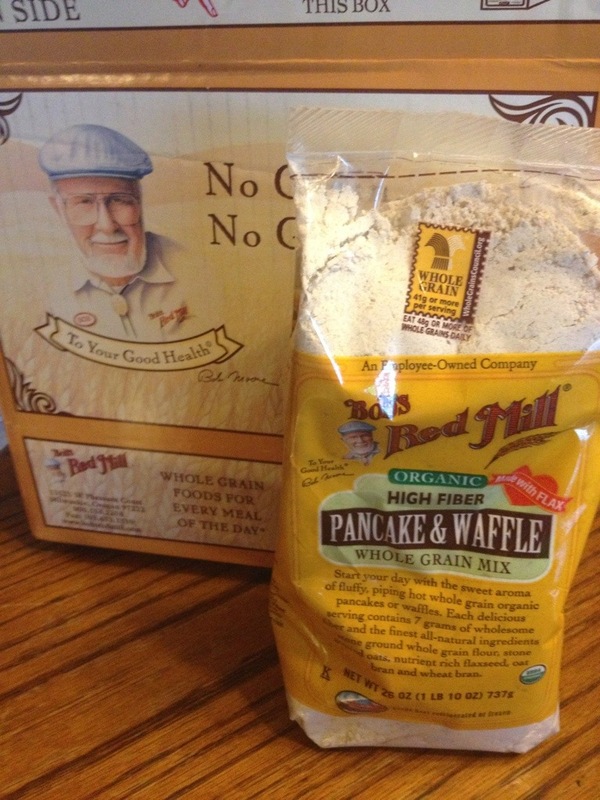 Both are a great pantry staple since they each are a high quality product. For the cupcakes, I actually only used half the mix to make 12 cupcakes rather than 24. I also halved the pudding mix. (So I am set to make another batch when needed!) After baking the cupcakes, I let them cool completely. I made the pudding and cooled it in the fridge for several hours. When the pudding had set, I transferred it to a piping bag fitted with a tip that had a smaller basic hole. I used the small end of a melon baller to scoop out just a bit of the center of each cupcake, and then I piped in the pudding until the cakes began to swell and the filling spilled slightly out of the hole. For the chocolate topping, I melted about 3 oz dark chocolate in the microwave for 30 second intervals until completely melted (a total of about 90 seconds). I then added a tablespoon of milk and a teaspoon of extra light virgin olive oil and stirred until mixed. 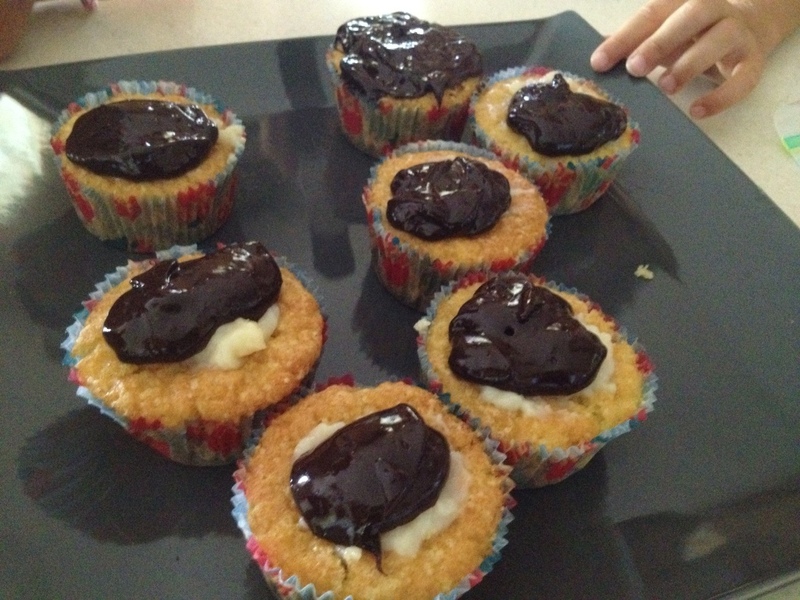 I put a dollop of chocolate onto each cupcake and simply smeared it across the top. Serve immediately or place in the fridge until ready to eat. Oh yeah- my husband and the birthday boy both had 2. They must have been yummy!